This is a guest post I made for The Stay at Home Something, a blog written and curated by my good friend Brooke Gale Louvier. In it, I detail the struggle of being both a mom and writer. Often, it’s a dark and difficult path. But sometimes, once in a while, there are days when my soul sings. Image credits go to Brooke. When you’re young, it seems that the whole world is full of adventure and promise. If you’re a writer or an artist, you seek to capture that wonder and possess it for yourself. Perhaps as an escape from the darkness in the world, or just for the ability to experience and share something beautiful every day. You’re a person who creates because that’s what makes your soul sing. But what do you do when the singing stops and you’re left with silence? I am a dreamer. Since I was a child I had a vision for my life that I held as the ideal. When I was four, I wanted to be a paleontologist and discover Jurassic Park for myself. When I was ten, I wanted to be Indiana Jones and travel the world. I wanted to read every novel and story ever written. When I was twelve, I discovered writing. I wanted to create and live the same adventure novels I devoured like they were food and water and my very breath. Then I grew up a little and wanted to be a missionary. For a girl who grew up in a charismatic church culture, this was the ultimate adventure. Serve God and have adventures? I could be a writer and a missionary! What an awesome idea! My whole life seemed to be planned out perfectly. Though there were many vague details, I generally knew what I wanted to do. I never struggled with trying to figure out what path I should take in life. Three years ago, my husband and I went bankrupt while in ministry in England, and had to move to a different country to start all over again. I also suffered a miscarriage. We weren’t planning to have kids for many years, so it was a double shock to us. This was the beginning of my worldview crashing around my ears. Right after the miscarriage and bankruptcy, I had to leave my husband for months to go back to the States to sort out my visa. Soon after I got back to my husband, we got pregnant. Since I was a young teenager, I have struggled with cycles of situational depression and anxiety. After a year that felt like I was taking hits right and left, followed by an emergency C-Section and postpartum depression, I fell into a dark hole further and deeper than I thought possible. I lost the desire to create, to live, to even get out of bed most days. My husband and I live in a country where we don’t speak the language, and can’t afford to put our son in a daycare. So I am a full-time stay-at-home-mom. I never expected this to be my life. How do you find the way to make your soul sing when nothing makes sense? I would be lying if I said I loved being a mother that first year and a bit. This sounds harsh, but I never believed a writer should conceal their true feelings. I can’t hold that rule for others and not myself. There were so many days when all I wanted to do was leave my son with someone else just so I could sleep or be alone. I felt better with time, though there are still challenging days. 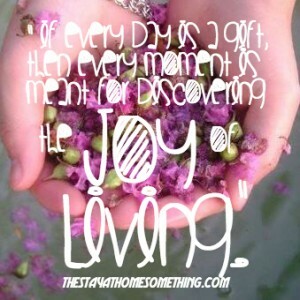 I am learning to find the joy in every day. If every day is a gift, then every moment is meant for discovering the joy of living. If you’re struggling with depression, with exhaustion, with lack of inspiration, or just plain old lack of motivation, listen. I hear you. I know what it feels like. I know the guilt can eat you alive. I know there are days when all you want to do is crawl back in bed and sleep the day away. I don’t have any easy answers. I don’t know what I’m doing most of the time. But isn’t that the grandest adventure of them all? What if the best adventures are not the ones you imagined as a child, but are the ones you live every day? I encourage you to find a routine that works for you. It takes monumental amounts of courage, but take it one day at a time, one moment of joy at a time. If all you want to do is write one word that inspires you, do it! Who cares if it’s not a whole sentence or a whole page or a whole novel? Give yourself the grace to live. Create your own adventure. Allow your soul to sing again. When you find a way to let a few notes out, over time they build to a symphony.